Orchids and Onions: Housing market hell. If we were to scrape together enough of our combined savings, then we may be able to purchase a place to live. But, man, in this market, who knows what we could afford. A corrugated tin shanty? An RV and attendant lot space? The picture ain't pretty. I was perusing the online realty sites this morning and saw that a burnt-out husk-of-a-house in SF, empty since 2000 after suffering a fire, is being sold for over half a million dollars. It's unlivable and one is meant to purchase it only to tear it down and start again. Are you joking me?! Condos, mostly flats converted from rentals--sorry, tenants!--are going for almost a million dollars in the most 'in' areas. These are places that, by and large, don't even have gardens, and, if they do, they are meant to be shared by all the residents in the building. A million bucks gets one a small park, in essence, replete with shared bbq grill and picnic table, but not a private garden. The above image is from a 2bd/2ba house in a nondescript area not near amenities, but within walking distance to public transport. The seller is asking for 700,000. 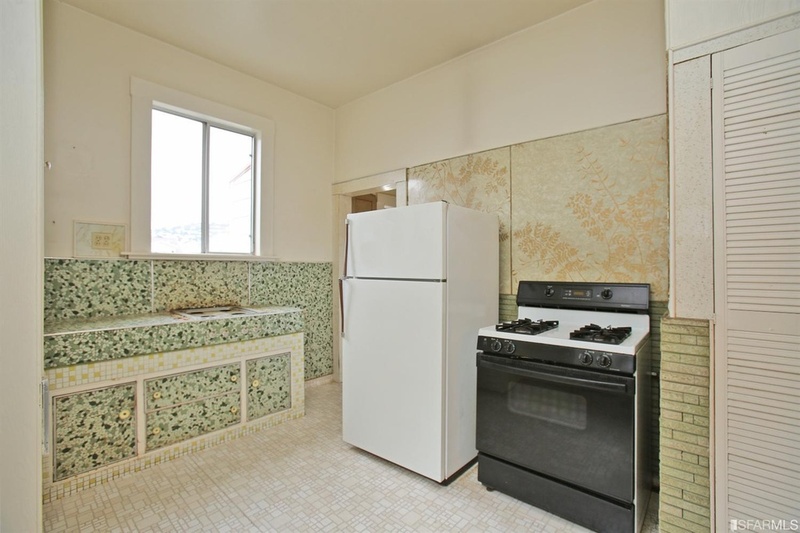 Every other picture of this unfortunate house shows a room as colorful, shall we say, as the above kitchen. Forgiving eyes might see the kitchen as 'groovy' I see it as gross.